Bending wood is a useful, and sometimes necessary skill. In this post I am going to present a few pieces of information which are key to successful wood bending of any kind, paleo or otherwise. The most common need for bending wood in paleotechnology is for straightening wildcrafted shafting such as arrow shafts, hand drills and atlatl darts. There are, however, many other uses for a straight stick. There are also plenty of uses for curved sticks, such as in the making of hoops and basket rims. Wood bending can be dropped neatly into the skill set of anyone who can internalize the following ideas. *Wet (or green) wood bends more easily than dry wood. Living wood requires a degree of flexibility to adapt to it’s environment, so green or wet wood is naturally flexible. Also, if the wood is heated to assist in bending, the heat will spread more rapidly into moist wood than it will in dry wood. Some items can be bent while green, or after soaking, without any heating. 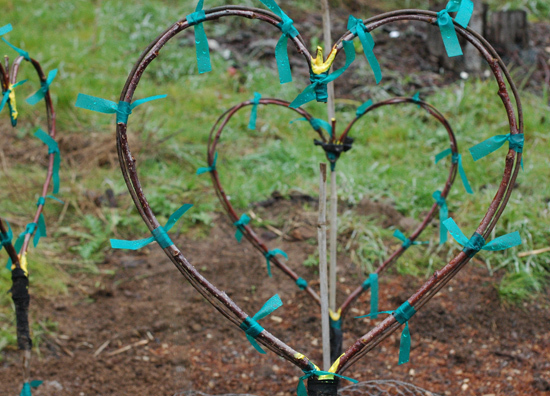 Green wood bends easily as demonstrated in these heart shaped apple tree grafts at Turkeysong.